The Camino Primitivo is a difficult, but beautiful Christian pilgrimage, extending 310 kilometers (192.6 miles) from Oviedo to Santiago de Compostela, through the northwestern regions of Asturias and Galicia in Spain. It is one of the Ways of St. James pilgrimage routes, or the Camino de Santiago in Spanish. On pilgrimage, we risk entering the unknown with the hope of being transformed. We leave our familiar world behind. We are also connected to a whole community of people who have taken this journey before us, those who travel alongside of us and those who will in the future. The journey transforms us so we may be ready for our destination. We are transformed in the the process and are allowing ourselves to be led through the experience by the divine impulse. This changes us on the inside and the outside. ~ Christine Valters Paintner, "The Soul of a Pilgrim"
If you are considering walking the pilgrimage route from Oviedo to Santiago de Compostela via the Original Way, here are the GPS tracks of our journey on the entire route, uploaded to Google maps. According to our GPS tracks, the total mileage is 310 kilometers (192.6 miles), but our official Compostela recorded 342. This Camino can comfortably be done in 12-14 days if you can log in about 22-24 km/ day. Otherwise, plan for more days. True Pilgrimage or Thru Hike? There are only a few days on the Primitivo which are long and without albergues, but you can modify this by arranging for taxi services if needed. The Camino Primitivo does take a bit of extra planning, but there are so many pilgrims and helpful Spanish hosts with which to share the task! I admit, the Primitivo was my second Camino, so I did feel more comfortable with the process, despite the additional trip planning necessary. The anticipation was still high for me, however. Since this was my husband's first Camino, I fed off his anticipation as well. If you need lots of infrastructure and lots of fellow pilgrims, this may not be the Camino for you. But if the opposite is true, I guarantee that it will be an experience of a lifetime! It may feel like a thru-hike to you, because we found that there are many fitness freaks on the Camino Primitivo! However, this does not have to be your experience. If you give it time, you will find that the same spirit of community and the same liminal experiences are there - however it may be you that has to create it! The rules of any Camino experience is to always go your own pace, and keep your eyes open to what may come your way! In fact, a most glorious, extended mountain walk, a Tour de las Cantábricas, so to speak, would be to combine the Camino de San Salvador, from León to Oviedo, a 6-day walk, then do the Primitivo from Oviedo to Santiago de Compostela. The Primitivo will feel like a cake walk after completing the San Salvador! Click on the link for a look at this fantastic high mountain walk. The Way of the Savior was created as an addition to the Camino Francés, taking a detour north from León to Oviedo to see the holy relics in the cathedral there. While one would like to translate the Camino Primitivo as "The Primitive Way," the more common English version of this Camino is "The Original Way." 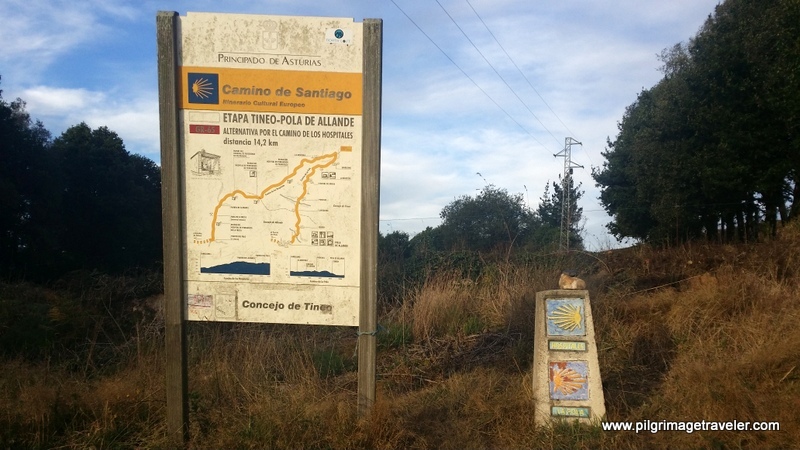 Even though the Primitivo is certainly more primitive, with less infrastructure than other Caminos de Santiago, it gets this English name from the belief that the very first pilgrimage route was established here. King Alfonso II (also known as The Chaste), the king of Asturias, Spain up until 842 CE, fought back the Moors and kept the region on the map. He did a lot to maintain the national identity of Asturias by building the new capital city of Oviedo, in a strategic place in the mountains. It was during Alfonso's reign that the remains of St. James in Galicia was discovered. The king himself, it is said, traveled to Galicia to help the Catholic church determine the authenticity of the find. When the discovery was confirmed to be St. James, King Alfonso II ordered the building of the original basilica in Santiago to store the apostle's remains. Alfonso II then established the first pilgrimage route, from Oviedo to Santiago de Compostela, hence The Original Way. He also became known as the protector of the Camino Primitivo, when he ordered castles be built along the way and knights were commissioned to protect the pilgrimage. In 840, Alfonso II was also able to secure the famous Shroud of Oviedo, another great attraction for the Christian, medieval pilgrim. This Shroud is believed to have covered the face of Jesus at his burial. The Shroud is currently housed in the "Cámara Santa"or Holy Chamber on the upper level of the Cathedral of San Salvador. The Original Way is steeped in medieval pilgrimage history, more perhaps, than the other Caminos. This is what drew me to this Camino, as well as its known physical challenges and its less-traveled appeal. I am not sure which drew me in more deeply. 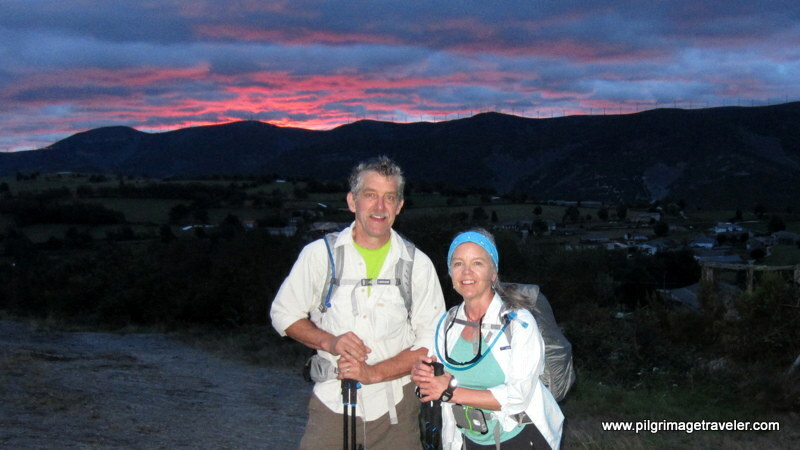 Below is my husband, Rich and I (Elle), the pilgrimage travelers at sunrise just outside of Berducedo, deep into the heart of the Camino Primitivo. We always liked to start out at sunrise in the morning, as the day was fresh and new. I would "receive" much more photo opportunities and feel the Spirit of the Camino, more deeply in these hours when the veil was thin. 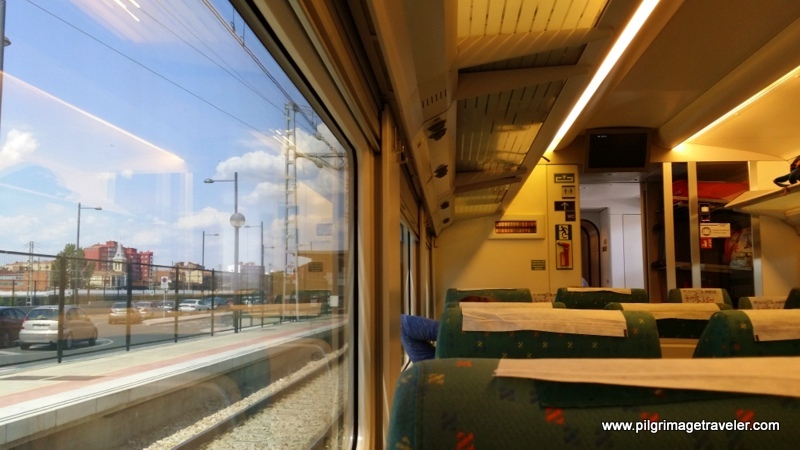 Our journey on The Original Way began with our train ride from Madrid to Oviedo. We found this to be the most economical way for us to travel. It was a four hour ride, after a long overnight flight from Denver, on a fast, modern and comfortable train, filled with conveniences. We found the ride to be beautiful, especially as we entered the northern mountains. We even managed to catch a few more winks in the early hours of the ride. You can book your own journey on Renfe online, prior to your trip. There are many advantages to doing so. The first is that your seat is assured. The second is that your transfer on the Metro from the airport to the Chamartín Train Station is free. There are two trains per day from Madrid to Oviedo, leaving from the Chamartín Station which is only about 11 minutes from the Madrid-Barajas airport. You can catch the Renfe train from the Madrid airport by first getting on the Metro at the T4 terminal. From the terminal, the C-1 Metro will take you to the Chamartín Station. It will not cost you extra, so make sure to inquire at the Renfe office in the terminal. When they see your printed Renfe tickets to Oviedo, they print out your Metro passes. Wonderful! Upon arriving in Oviedo, we were able to walk to our Hostal Romero, only about 10 minutes walk from the train station. 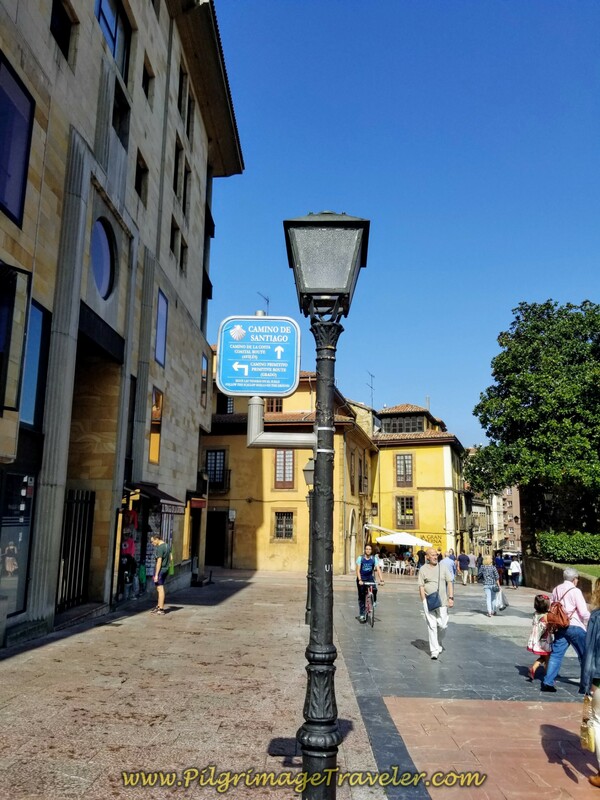 I had purposely chosen a hotel as close to the station as I could, so we could spend that afternoon seeing the sights of Oviedo, and mapping our course for the morning. There are many more accommodations in Oviedo, including the giant Albergue de Peregrinos El Salvador de Oviedo, in the monastery south of the cathedral. If you click on the link, you will see more information and a walking map to the albergue. Click here to see your options if you prefer reservations or accommodations other than the albergue. I had studied the town on Google Maps before our arrival, and was able to find places without any issue. I used my Google Maps App on my smart phone, and expertly navigated our way through the town. 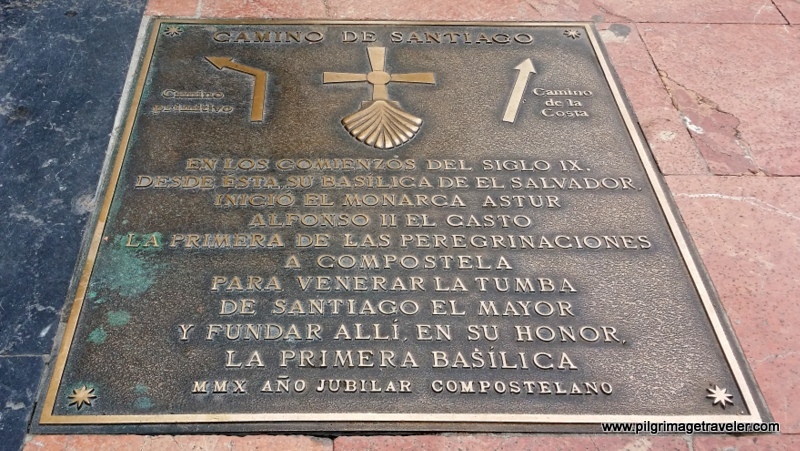 Right by the famous San Salvador Cathedral, to the west and directly across from the statue of Alfonso II, there is both a signpost and a plaque marking the beginning of the Camino Primitivo. The sign post is on a lamppost and the plaque that marks the official beginning is just below it on the pavement. The signpost directs the pilgrim to either the Coastal Route or the Primitivo Route. I found it interesting that the "official" sign in Oviedo calls the Original Way the Primitive Route! The officials chose the literal translation, I suppose. Here is a close-up of the sign. Here we are once again, the pilgrimage travelers full of happiness and anticipation for the journey ahead, being photographed with the plaque. Below is a lovely close-up of the plaque. A rough translation of its inscription is as follows: "Camino de Santiago, beginning in the ninth century. From the Basilica of The Savior, begins the Asturian King Alfonso II, the Chaste, the first of the pilgrimages to Compostela, to venerate St. James the Greater and established there in his honor the first Basilica. (2010, 'Jubilee' or Holy Year of Compostela)"
I love the quote at the beginning of the article, as it so readily describes the relationships that you form along the Camino. For most, the connections that you make is a vital part of the Camino experience. Below is a photo of my "Camino Family," taken in Lugo, a large town along the Camino Primitivo. Lugo is about 2/3 of the way into the Primitivo, so our relationships were strong by this time. 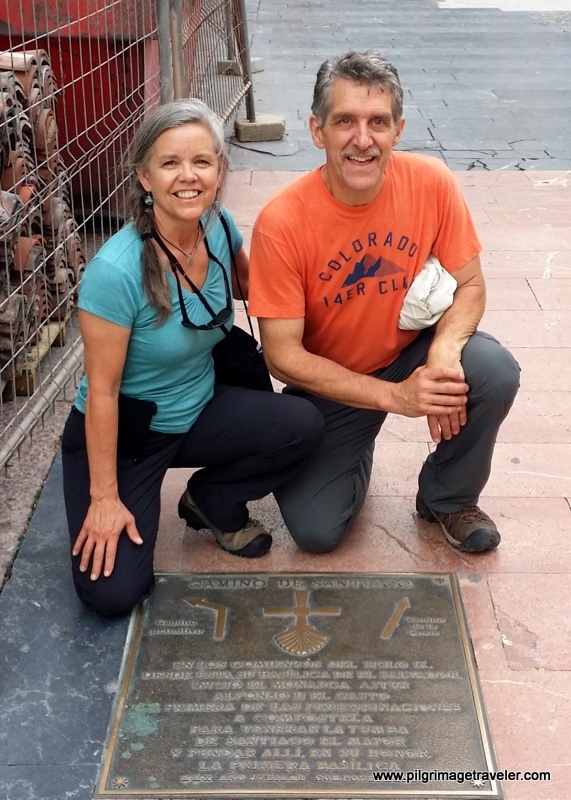 Even though my husband and I are very fit, and accustomed to hiking in the mountains of Colorado, we found that we had some major adjustments on the Camino Primitivo. It took about 3-5 days for our shins to adjust to the frequent pavement walking that we found we had to negotiate. I was wearing knee supports, but found that in the first days of more pavement walking than the later days, it was my shins that throbbed. Rich also suffered from shin splints, and in fact began wearing his knee supports on his shins instead! I have several photos of him with his shin supports and he looks like he is wearing some kind of funky compression hose! 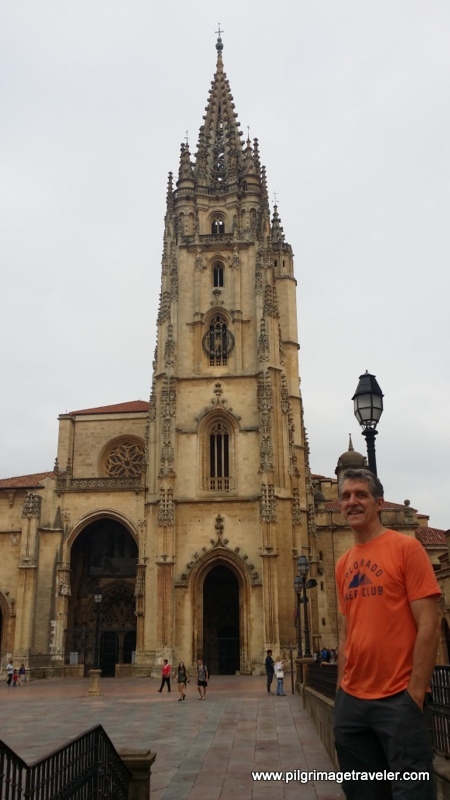 Starting in Oviedo is a treat, as this town has some of the oldest churches in Europe. While we had to squeeze our visit to Oviedo in an afternoon, we did visit the Naranco sites the first morning. We shortened our first stage, since we added 6.2 kilometers to the days walk that included these UNESCO World Heritage sites. My only regret is that we did not spend another day in Oviedo. It is a wonderful town. Plan your own Camino accordingly. Our first official steps on the Camino Primitivo was through the town of Oviedo. The way is marked with these lovely bronze shells on the pavement. Many pilgrims describe difficulty in finding the way through Oviedo. We found that you just had to pay very close attention to the sidewalk. 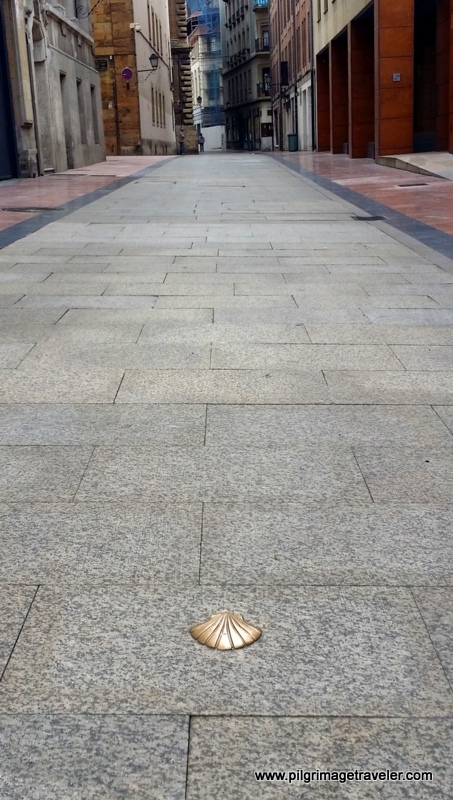 A change in direction is always marked on the sidewalk for you by a bronze shell, as shown in the photo above. The rest of the Camino Primitivo is well way-marked. Again, you must pay attention, to keep from getting lost. Below is a symbol that we saw frequently on the Original Way. I was never able to discover its meaning, but I translated this infinity symbol to mean, don't stop going! 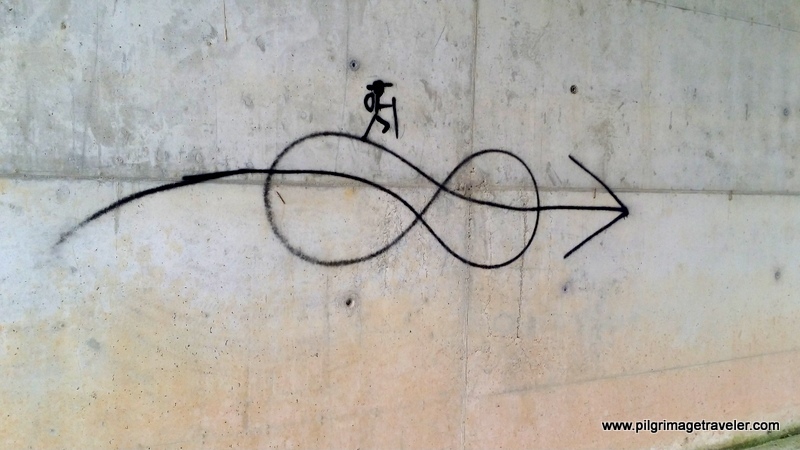 One enters infinity through the left, traces the circles and comes out through the right, with an arrow - don't stop walking! If the weather is bad, the Camino Primitivo can be brutal. Amazingly, we were so fortunate to have almost no rain for our entire 15 days on this Original Way! Almost unheard of! The Camino gods were smiling on us, I suppose. Below is the fork in the road on the 5th or 6th stage, where you can choose the Hospitales Route or the Pola Route, depending on the weather. If it is foggy and/or rainy, it is advised to avoid the mountainous Hospitales Route. Fork in the Road - Hospitales or Pola? 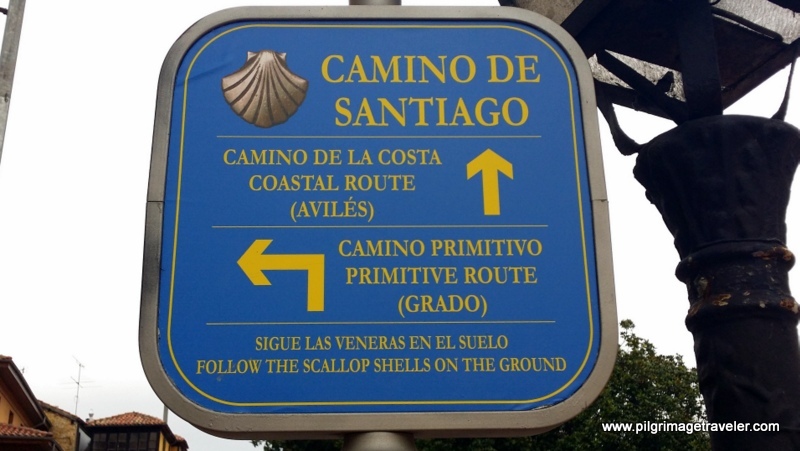 If one chooses to use the translation as The Primitive Way, you will find that this Camino is aptly named. The Camino Primitivo is one of the less traveled of the Caminos because of its difficulty. It has much less infrastructure, and if you read on, you will see that there are very long stretches without much of anything! However, I suppose this will change in the future as even this Original Way becomes more popular. The closer we got to Santiago, especially after Lugo (the final 100 kilometers on the Primitivo) and where the trail merges with the Camino Francés in Melide, the more pilgrims we saw. For now, the Camino Primitivo is wild and free, and most enjoyable! There is very little English spoken, so please plan your trip accordingly. If you click on the link in this paragraph, I have many useful suggestions to help you enjoy your trip as much as possible. You may also be interested in my packing list, to help you plan what you take in your own backpack! May you have a most wonderful Camino Primitivo to Santiago. May you always be a pilgrimage traveler, who is transformed both inside and out!